From the uncoded portion of the Doctor's journal. Having collected Miss Waterman from the coach she had been placed upon by the Hegwoods, I transfered her belongings into MY carriage for the trip out to the Farnsley-Moreman Estate along the Ohio River for a relaxing weekend among friends. In the morning, I demonstrated the Art & Mystery of Surgery to an assemblage of pupils from the local schools. They seemed to be quite taken with my lecture, but I have discover'd that children are usually eager to learn about my 'bloody' profession. Between groups, Miss Waterman took notice of my things, strewn upon the table, namely, my recent correspondence. "Is that a letter to you from my Aunt Elizabeth?" she queried, her slender gloved finger extended toward it. My heart leapt in my chest, "It is." answered I. "Whyever do you have a letter from my Aunt?" she continued. I offered her no excuse, choosing instead to distract her and move on to a more agreeable subject. After my demonstrations, it was requested of me to stay in the pavilion and wait for a reporter who was desirous to speak with me about my profession. I do believe that Miss Waterman had grown weary and asked if she might stretch her legs down by the river's bank. "And leave you unchaperoned?" asked I. Says she, "Do you not think Doctor that you will be able to see me plainly from here?" I could not argue it and released her to go on her way. Once the reporter had gone, I packed my instruments away in their box, and looked down the hill to espy Miss Waterman seated on a bench along the path that lead down to the water. Miss Waterman and I took a stroll by the river and made the appropriate comments on the weather, humidity, the unkempt state of the dock and so forth. We also briefly discussed the nature of the local birds and beasts. In the cooler portion of the afternoon, Mrs. Cooper had planned to have archery practice for any of the ladies that might wish to participate in the competition that was to be held the next day. I escorted Miss Waterman to the front lawn where they took their exercise, taking aim at a target I had painted for the occasion. Mrs Cooper and Miss Waterman prepare for Archery practice on the front lawn. The novelty target I painted for the ladies to make use of. Miss Waterman keeps Mrs Cooper from browning in the sun whilst she takes aim. the lower Serratis posticus inferior region. Mr. Cooper came down the lawn from the direction of the house and we discussed plans for supper. A number of us gathered to take a meal of various types of fish and potatoes. In the party were Mr & Mrs Cooper, Mr & Mrs Dubbeld and a blacksmith by the name of Mr Aubrey. A grand time was had by all. We had so much left over by meal's end that we collected it and carried it out to poor Captain Cushing, who seemed not to have a single morsel to eat. The remainder of the evening was spent in pleasant conversation outside Capt. Cushing's tent where, I also shew'd Miss Waterman how to make use of my mechanical quill'd pen. She took great care in writing her name with it on a scrap of paper, followed by her letters and numbers. Ms Waterman placed 3rd behind Mrs. Martin and Miss Martin, who, as I understand, have been at archery for a long time. One present even said in jest that miss Martin had been at it since the womb. Miss Waterman wore her participation cockade with pride. First on her little brown spencer, then later transfered it to her beret. Ms. Waterman was taken with the heat. Rested in tent. I fed her spoonfuls of iced cream and sips of water while bathing her brow and neck with a moist handkerchief. The night was less cool than previously and woke to a warmer morning. It was decided that perhaps a nature walk in the cool of the morning might be in order, so therefore, we gathered a party and began straight away. Our line slowly passed the Farnsley-Moremen house and wove around through the gardens to the side. On the far edge of the garden there was a break in the fence that lead outward into a grouping of trees with a path down the middle. The farther we went, the more of the ladies dropped out of the walk and ventured back, stating a bevy of excuses from 'poison ivy' to 'heat'. Eventually we made our way away from the trees and into a clearing only to discover that there were only five of us left. Mrs. Dubbeld escorted by Capt. Cushing, Mrs. Mudd and Miss Waterman and myself. "I want to run!" Miss Waterman confided in me as she began to slow and let the others move ahead. I feel certain that my demeanor begged the question, 'why?'. "It's so open and beautiful here," says she, "I feel the need to run across the field." "That would he highly improper." says I with eyebrow cocked, and knowing she was of her own mind on the subject, I continued, "I shall not speak a word of it to anyone if you were to do so." Miss Waterman smiled and clutched at her blue dress to avoid stepping on it as she set off at a fearful pace. As she ran, one of the feathers fell from her upturned straw hat. I collected it and held it behind my back as I approached the party. The group seemed none the wiser that she had made such a vigourous run. Covertly, I handed Miss Waterman the feather, saying, "This seems to have become dislodged from your hat by an errant breeze." The remainder of our party became quite wilted from the heat and decided to turn back toward the house and the shade. Miss Waterman however wanted to proceed to the small chapel we could see in the distance, so I escorted her to it. The aged little building had long since been boarded up, its windows and doors all shut up. The grass was quite tall around its exterior and the brambles and thorns clung to my knee breeches and to her blue dress's hem. Tea at 3pm. This time, tea was served under the shade of a convenient grouping of nearby trees. The two teas served were a delightful lemon and a vanilla caramel. Miss Waterman was quite taken with our hostess's little copy of 'PAMELA or Virtue Rewarded'. She sat and read for quite a while. The company assembled asked me to read from my copy of Henry V. Below, find an abbreviated version of the speech I read them. Shortly after tea was served, at about three of the clock, I went once again to demonstrate the Art & Mystery of Surgery. Every chair was full, and when more people showed up to watch, we brought more chairs down out of the back to accommodate them. Some of the gents were quite desirous to have me join them in some fencing practice, but I was far too exhausted to take them up on their offer after my demonstration. There will be a group of Acastas this coming weekend at the 200th anniversary of the first battle of Ft. Bowyer, put on by the 7th United States Infantry Living History Association. 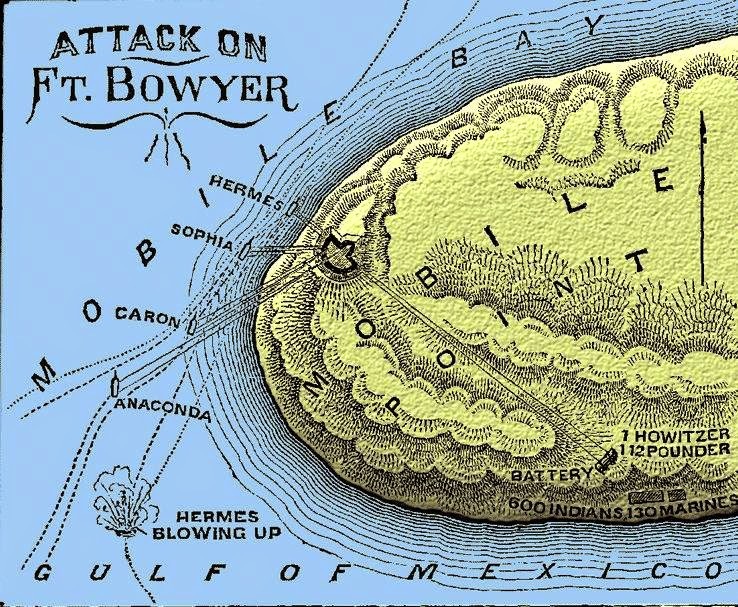 This image of Ft. Bowyer is from Lossing's Field History of the War of 1812. The location is Ft. Morgan State Historic Site on Mobile Point. The fort is about 25 miles west of Gulf Shores Alabama on HWY 180. Friday is a school day. Main public activities are on Saturday. No programming is scheduled for Sunday. The Park opens at 8:30 am both days. Morning Colors are at 9. A complete schedule of activities will be available at the Fort. If you are in the area, stop by and pay the Acastas a visit and be sure to remind them that their Doctor says they are to take their 'blue pill' while they are away from the ship!